You can be sure that you are getting the most reliable and secure services from compevo. Our reputation for superior services and uptime was built on superior infrastructure. We operate out of the best multi-million dollar facilities in the world and stategically place and plan our deployments for superior uptime and reliability. We're neighbors with some of the best datacenters in the world including Google, Facebook, Disney and others. Facilities located out of high-risk disaster zones, but close to main fiber hubs. Facilities located just outside of downtown cores (when possible). Extra fuel stored close by. We Were Up But Was Your Datacenter? Many clients turned to us for our expertise and services after they lost power in the Northeast Blackout of 2003 affecting over 55 million people in the Canada and the USA. 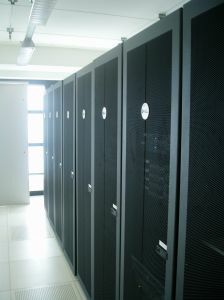 All of our facilities remained online due to multilple diesel and UPS backup systems. In fact none of our facilities in the world have ever gone offline due to a natural disaster.